The Google mobile algorithm update was rolled out in April. So, what’s next? How will mobile activity affect us in the near and far future? Is it really important to switch your site to be mobile-responsive? Will you still receive traffic if your site is not mobile-friendly? Ok, let’s start answering these questions by discussing how important the mobile update is. 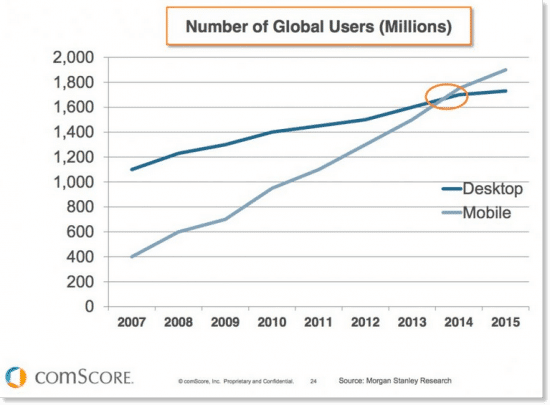 Mobile traffic has been growing increasingly and more of us are using mobile on a daily basis. About 80% of smartphone users shop on their device, which means mobile use does not just involve checking your Facebook, Twitter or other social accounts. We watch TV, shop and bank on mobile phones. And mostly important – we do a huge amount of research, comparing prices and products. High quality content. Your site can still rank above others if your page content is relevant to a user’s search query. Research, analyse, and publish great content. Mobile specific ads. Try and deliver a message within the ad copy with a CTA relevant to a mobile user. What can they do right at that moment in order for you to get a visit to your site and a possible conversion? Call-only ads. This CTA is the easiest solution that can be implemented to get a user engaged with your business. It’s a button, it’s there, it’s just one touch away from a sale. Call-only ads can only have the option of calling and cannot direct traffic to the site, which can be an advantage if your site is not mobile-responsive. This way you can deal with a potential customer without worrying about them bouncing away from your website. Click + Campaign menu and choose the Search Network only option. Name your campaign and append it with “call-only”, so it can stand out in the list of other campaigns. Choose the campaign type Call-only – Ads that encourage people to call your business. Choose your Networks, Devices (only those that can make calls) and Location targeting. Select “Bid Strategy” bearing in mind that all clicks will result in call to your business, so appearing in first positions is beneficial. Select any other setting you’d like. Now that the campaign is created, you can start writing your ad copy. It’s important for your ad message to be tailored to the call CTA. Try and create description lines to promote a call and include messages like ” Speak to our specialists today” or “Call to book your appointment now”. Your ad copy does not need to be to heavy and descriptive as long as it sends the right message and results in a call. Exploring call-only ads as part of your PPC strategy is beneficial. Unlike the call extensions, the number will appear right at the top. The call button is displayed next to the text message, which enables an immediate call to action. A call is a direct conversion, whether they make a booking or make a payment. With a standard PPC ad there is always a chance of browsing and bouncing without completing an action. If you haven’t yet explored call-only ads it can be a great way of getting mobile traffic to your site, and is definitely worth a try.